What a ride! I’m shocked and appalled at the incidence of thievery and deception out there, and it is utterly amazing how easily it can all take place. 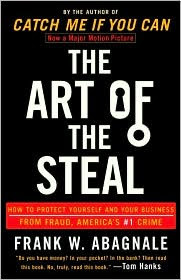 Frank Abagnale is the author of The Art of the Steal, and you may remember him as the person Catch Me If You Can was based upon. What else should an expert conman do after turning straight? Why, provide information on how to catch guys like him of course. Clearly, Abagnale is a very crafty and intelligent man for all of the shenanigans that he was able to pull off in his past, and now, marketing himself and his abilities after the fact. Between his books and his lectures, he most certainly must be comfortable. He has created this valuable collection of warnings teaching how to minimize your vulnerability and risk of being taken advantage of, and only briefly goes over his past deceit. That information can all be obtained in one of his other books, so I was happy with just short outlines. I chose to listen to an audio book for this one and I’m really glad I did, as there are short sections that you can easily leave and come back to. Also, the narrator has great timing and a calm way about him when reading, which makes it relaxing, even though the content might have your stomach in a knot. It’s ghastly and terrorizing to think of the lives that have been lost to medications and airplane parts that are being counterfeited, or the identity theft that can take place from a simple obituary. Although I’m sure this will help many people in their attempts to protect themselves, I shudder to think how many crooks are polishing up on their skills with this information. What’s the haps, Yo !! ?